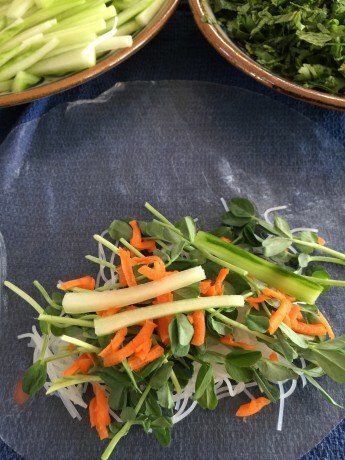 At this time of year, there are some superb spring greens to substitute for lettuce to make delicious, healthy fresh spring rolls. Last week, I used Caitlin's pea shoots - so good! In the next few weeks, I'll be picking watercress - and that make another great addition, as many locals here can attest to. Give it a try. Kids love them too. Have all ingredients cut and ready in bowls. Fill a skillet with water and bring to a boil. Once it boils, turn heat off and then reheat as needed. Quickly dip 1 rice paper wrapper in hot water, making sure it’s submerged. When flimsy, a few seconds, transfer wrapper to a clean, dampened dish towel. Spread pea shoots and fillings on bottom third of wrapper. Starting with end closest to you, roll the wrapper tightly around the filling. When it’s rolled halfway up, fold the sides of the wrapper toward the center and continue rolling to the end of the wrapper. Note: Spring rolls can be made up to 3-6 hours ahead of time, wrapped in plastic and stored in the fridge. They don’t store well overnight – so enjoy them the day you make them. If you’re unsure of the rolling technique, my guess is you can find videos on u-tube.